On Friday we received a very beautiful and generous gift from our friends at The Yarnery in St. Paul. 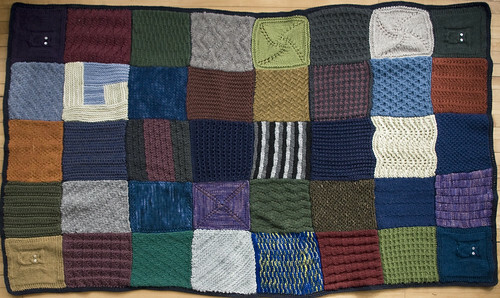 Pooling together talent and stashes many of the employees contributed to this body and heart warming blanket. It did come as a sweet surprise and we are both touched by the time and effort (and organizational prowess) that went in to creating this. Thank you so much for this. I have already made good use of it, especially during my naps and rests during the day. I’ve definitely been needing extra covering as my body still seems to have a hard time keeping me feeling warm (even during the past 75º days, but especially now since it’s back in the 40’s). And, since I start my second round of treatment on Monday, I have a strong feeling this will be seeing a lot more use in the coming weeks. 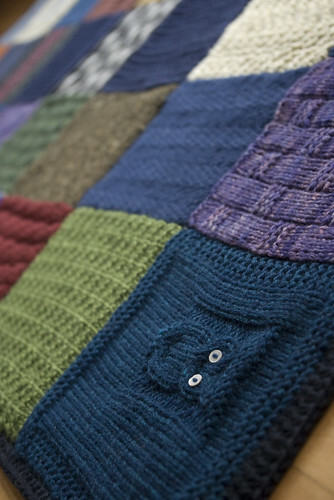 It’s hard to pick a favorite square, they all offer interesting color and texture. 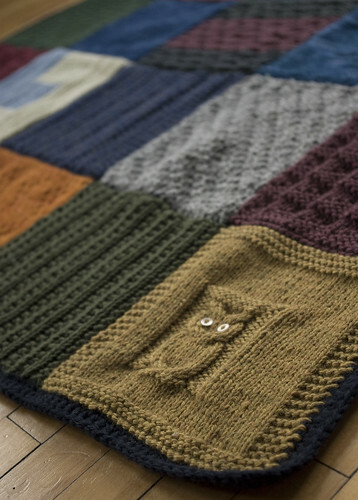 I do have to say, though, the owls on the corners are a nice touch—like watchful sentries making sure the warmth stays in. Thank you, again, for putting this together. What a beautiful, thoughtful gift. I also want to thank The Yarnery emplyees. I know this will keep you warmer and you will think about those people who put it together for you. Our thoughts are with you, Dan and Virginia. 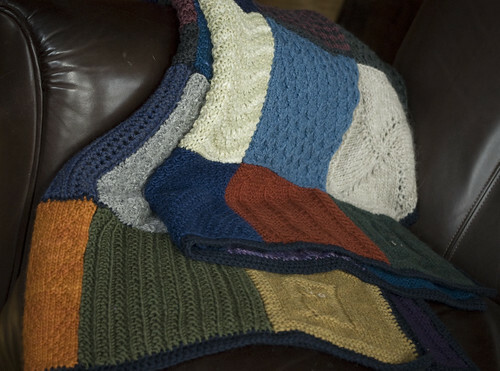 What a great blanket! Those owls are cool. Even moreso now that you’ve added that wonderful sentiment to them. Watchful sentries indeed. How thoughtful! Not only body warming — heartwarming, too! I passed by the Yarnery last night on my way to and from a sushi class at the Cooks of Crocus Hill. Seeing the Yarnery sign, I thought of you and Virginia. I hope you both are doing well. that’s a beautiful gift! Sending you both tons of well wishings and good vibes for your treatment, courage and love! I am so happy you are enjoying this! I must say that I put alot of loving thoughts into my squares and it put my extra 13 mile and poppy to good use!!! Love and hugs to you both!